In the digital age and fast-paced world of digital marketing, you may have heard the terms Search Engine Optimization (SEO) and Search Engine Marketing (SEM). 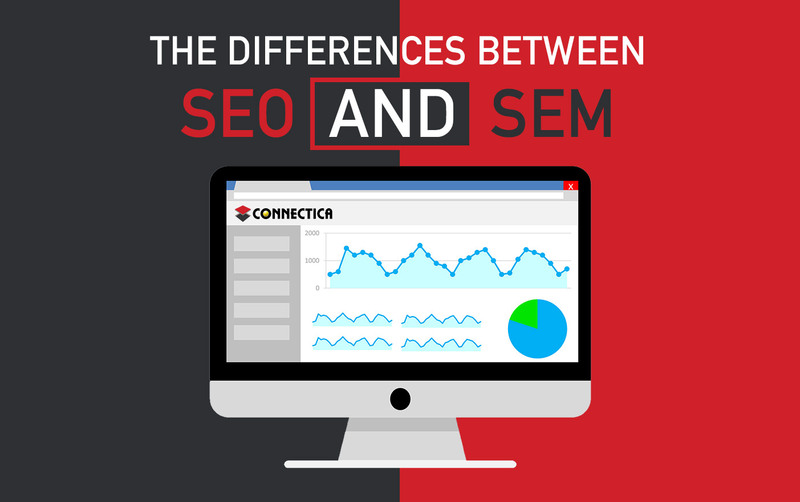 Though both SEO and SEM have similar characteristics, there are differences between the two, especially in the way search engines determine placement. Search engines are used every day to find resources and reviews, goods and services, and for online research. The top three search engines used today are Google, Bing, and Yahoo. When you enter text in the search field of an engine’s search bar (or in those browsers where the search engine is embedded), a unique algorithm searches every published page for content containing those specific keywords which match. Think of an algorithm as a predictor based on what keywords you use. A search engine marketing company, such as Connectica, functions as a conduit between their client and the search engine to yield high ranking results and drive traffic to the client site. SEO is used to increase company or product visibility in search engines organically. Organic search engine rankings are the result of a strategy that includes keyword optimization, authoritative and relevant content, links (both external and internal), website optimization, etc. These are just a small example of the factors used within the search engine algorithm to rank sites. SEM is used to increase company or product visibility through paid advertising. Paid Advertising needs to consider the online platforms used by the targeted users for the brand to budget for more conversions. There are several options for paid advertising in the online world such as; Pay-Per-Click (PPC), Google Home Services, Social Media Platforms, etc. SEM uses some SEO techniques in regards to keyword optimization and content to attract users to not only click the ad, but to actually become a paying customer through the ad as well. Though both SEO and SEM work to get a company or product visible to potential customers online, there are differences between the two. Since SEO is organic and relies on the search engine algorithm to get prime placement, it can take several months or so to see the results of the work going into it. Though it takes a while to see the results, they are often long-lasting. This is a major difference between the two and should be taken into consideration when creating a digital marketing strategy. SEM is paid advertising and the budget you have available to spend may determine where you rank. Google has a bid strategy so the more you spend, the more chances you have of displaying in the top of the Ad results. Results with paid advertising are generally seen much quicker as you are not building trust and authority with a search engine, but rather paying for a prime spot. This also means they are short-lived since as soon as you stop paying, those results disappear. Is SEO or SEM Better for My Company? SEO is definitely a necessity for any company looking to rank in the search engine results pages. SEO knowledge is also required to make a successful SEM campaign as it helps to optimize the ads for conversion. Having the opportunity to do both is helpful as it would allow you to get the quick exposure of paid advertising while you work on your longer lasting SEO rankings. You definitely want to work with someone who knows the digital marketing world when creating SEM campaigns, especially since you are paying for the ads to be seen or even for every click into them depending on what platform you are advertising on. Both strategies are important in getting your company or product in front of customers online. Knowing the similarities and differences could help you determine the best strategy for your company.